Flyers goalie prospect Carter Hart. The tiny faces and beaming smiles were always there in the players' tunnel, the first two hopping on their toes to provide the perfunctory fist pump for everyone who stepped on and off the ice for the Everett Silvertips. 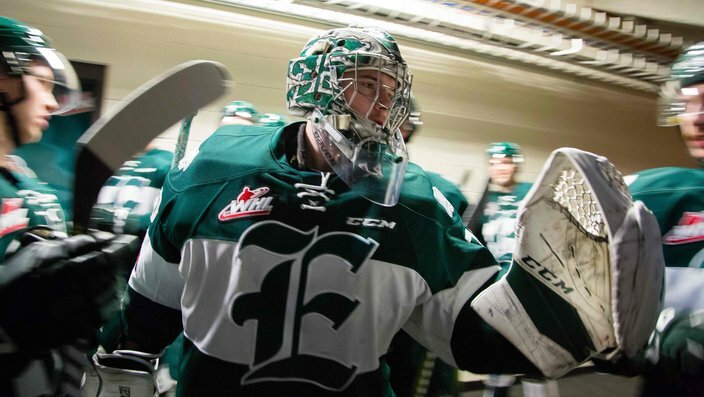 Carter Hart was instantly drawn to them since he arrived to play as a 16-year-old in the Western Hockey League — Connor, a 7-year-old autistic boy, and Cavan, a 6-year-old, who were both at every Everett home game. Win or lose, the boys didn’t care. They got to touch their heroes. It didn’t take long for the duo to take to Hart — the young goalie sensation from Alberta, Canada, who the Flyers selected in the second round of the 2016 draft — and he to them. It’s why Hart felt compelled to uphold something he saw after returning from his first Flyers’ development camp in September 2016. There, standing where they usually stand for all Everett home games were the familiar faces of Cavan, in his No. 70 Hart Everett jersey, and Connor, who was wearing something new — a Flyers’ Hart jersey adorned with the No. 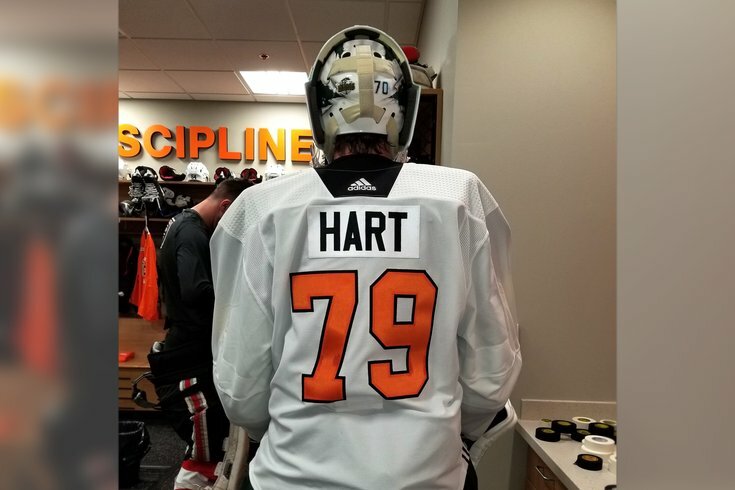 79, Hart’s developmental camp jersey number. Don’t be surprised in the coming years to see the No. 79 Flyers’ jerseys springing up everywhere in the Delaware Valley. I probably would have stuck with No. 70, because that was my number in juniors. But because Connor had the Hart No. 79 Flyers’ jersey on, I realized I couldn’t change the jersey number now. That’s the number Hart, the first-ever two-time Canadian Hockey League Goalie of the Year award winner, will wear when he plays for the Flyers. What’s more is that 79 is a number that’s never been worn by a Flyers’ player during a regular-season game. A unique digit for a unique player. “My first development camp with the Flyers they gave me 79, just because the rookies get the higher numbers,” said Hart, who turned 20 on August 13 and wore No. 70 in Everett and will wear No. 31 for the Lehigh Valley Phantoms. “Connor and Cavan were there since Day One when I was in Everett. I remember those two kids ever since I started playing there. “When I came back to Everett, Connor was there waiting for me, like he usually did, and he was yelling at me trying to show me his new jersey. He had a Flyers’ jersey with Hart No. 79 on the back. When I saw that, I decided I had to stick with No. 79, because there is a No. 79 out there. Carter Hart last season with the Everett Silvertips. Hart told Connor that he was going to keep No. 79 when he got to the Flyers. The second person he told was Flyers’ equipment manager Derek Settlemyre that he would keeping 79, and Settlemyre had no problem with it. “Connor was pretty excited,” recalled Hart, one of the most accomplished junior goalies in history, becoming the first three-time Del Wilson Memorial Trophy (WHL’s top goalie) winner and a national hero by leading Canada to a gold medal at the 2018 IIHF World Junior Championships, where he recorded a .930 save percentage in seven games. “Connor was happy he didn’t have to change his jersey. I thought it was really cool that he showed up to the Everett games with that jersey. He was the first one who I ever saw in a Flyers’ jersey with my name on the back. I had to keep 79. Connor is a big fan, and you have to honor the fans, especially the young fans who watch every move that you make, right? My goal is to make the Flyers this year. For me, going into camp, I have to worry about what I can control. I can’t concern myself with what anyone else thinks. Last season, Hart led the WHL in goals-against average (1.60), save percentage (.947) and shutouts (seven). That takes into consideration the time Hart missed at the beginning of the WHL season with mono and the world juniors in January. There is one thing Hart will change this season, whether he’s going to play for Lehigh Valley or for the Flyers. “I realized it’s a dumb superstition to be the last one off the ice,” Hart said, laughing. “It was something I did ever since I was a little kid. I had to realize that it doesn’t make me play better. All it really did during the world juniors was add to the distractions that we didn’t really need. People got a hold of that in the wrong way. I think I blew it a little of proportion myself. Moving forward, I don’t really need any of that. Since Hart was last in the Philadelphia area in June, he’s added seven pounds. He’s 6-foot-2, 190 pounds. He’s coming to Philadelphia on Sunday, September 2 with the hopes of going to the Eagles’ home opener on Thursday and meeting Carson Wentz. Flyers’ training camp starts September 14. “My goal is to make the Flyers this year,” Hart said. “For me, going into camp, I have to worry about what I can control. I can’t concern myself with what anyone else thinks. If I keep my focus on that, I think I’ll be okay. My body feels good. I’ve been training five days a week and skating three days a week. There are no Hart No. 79s currently hanging in the pro shop at the Flyers’ Skate Zone in Voorhees. That could change very soon.